As a composer, I often have musical ideas that need to be captured immediately. So rather than crank up the entire studio, or even the portable laptop studio, the best and quickest way to make sure ideas don't dissipate into the ether is to use my Android cellphone. Because I save the bulk of money for pro equipment that I won't accidentally lose when I'm spending the remainder of my money in bars, I don't have an iPhone (nothing against Apple; I use a pair of Macs for professional music use). But a combination of factors—mostly driven by the lack of funds remaining after purchasing recording equipment and alcohol—has kept me using a Samsung Galaxy Ace 2 GT-I8160L still running Android Gingerbread. The phone works, but its recording software leaves something to be desired. Armed with a budget of zero, I visited the Google Play store and downloaded the top five free voice recording apps, and set up in front of my phone with an acoustic guitar and played the first verse and chorus of Imperial State Electric's "I'll Let You Down," hoping all five apps wouldn't let me down. They didn't. 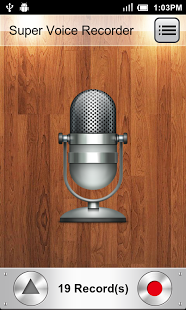 One unique feature worth mentioning is the microphone adjustment feature, which allows users to calibrate their phone's mic. Mine was set to a gain factor of 1.1x. There's also a mic level tester equipped with a graphic horizontal bar, but it shows no dBs, so it's not all that helpful. With the encoding set to "high quality (PCM)" as opposed to "balanced size/quality (AAC)" or the frightful "small files (AMR)" setting, I left the PCM at the second-highest sample rate of 44 kHz—which they call "CD quality," as opposed to the pointlessly large file size of the top-notch "film quality" of 48 kHz. 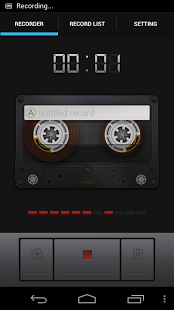 The nice retro cassette graphic interface leaves a space along the tape's label to type a file name and the rest of the settings are as simple as they come: a choice of either .amr (Adaptive Multi-rate) or .3gpp file types, and a box for enabling high quality audio files. Having once used another voice recorder that had only .amr files (which use low bit rates that are painfully reflected in their sound), I opted for the compact and cellphone-ready.3gpp file with the high quality kicked on. Beneath the hood, you don't find too much to this app beyond a changeable skin (black, grey or the appealing wood default setting) and a seven-option switch that goes from "lowest" to "highest" quality without much indication of what those or any choices in between actually amount to. But throwing caution to the wind and seeing just how much I could still cram on to my 32GB memory card, I opted for the best. With a running clock and a record button, this app is almost too simple in its design. It looks more like you're about to set a time bomb than sing a bass line idea. The app offers a timer (though I don't know what for) and absolutely nothing else worth mentioning. 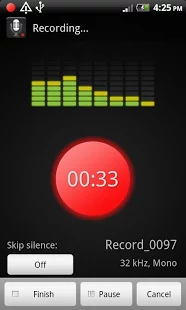 Conclusion: If you've got space on your phone, Smartmob's Smart Voice Recorder is the way to go; if you don't, Lovekara's Super Voice Recorder is an acceptable understudy. Nico Westerdale Thanks to Corey for being the first to write for BitsDuJour! We're looking forward to seeing many more articles coming up. Please let us know what you think in the comments below. Andy Deane Love the look of the Rabbit app! Gonna give a couple of these a go... thanks for the info! Nico Westerdale DroidLuvr, Thanks for the words - I can tell by your username that you were going to like this one! We do accept submissions for articles. They must not be published anywhere else, and fit into one of the main categories of the site that you'll find in the menus. We don't accept anything too 'advertorial' and we prefer HTML format. 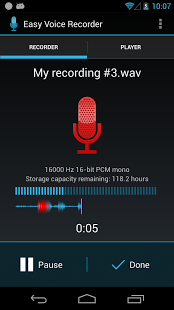 Ernest User GoTranscript voice recording app is one of the best voice/audio recorder application in Google Play. 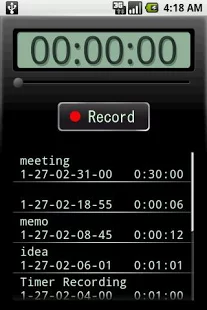 The unique feature of this application is to let you record the voice or audio and transcribe it in to text.